Hi everyone!! Boy, it's been a busy week here and the weekend is just as busy. My son has his confirmation tommorrow and on Monday his 8th grade Honors assembly. I will probably cry--I just can't believe he's leaving 8th grade. 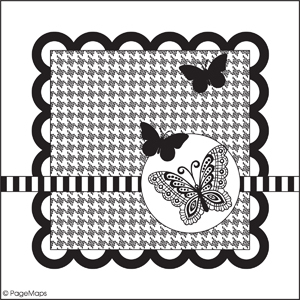 Today I have a card for you that I made from a Page Maps sketch. Make sure to visit Fantabulous Cricut today for Scrappin' Saturday. The design team made some cards and pages from these wonderful sketches. Above is the sketch and below is the card I made and some details. I used Elegant Edges for the green dotted background and Cricut American Alphabet for the butterfly and the swirl. I don't remember the sizes, but I do know the butterfly was smaller than I thought it would be but went with it anyhow :) The stamp is from My Pink Stamper Spectacular Sayings--a wonderful new set she just released! Pretty color combination and nice cuts. Great job, Helen! I love the scalloped square and the pink and green combination is just lovely! What a pretty butterfly! I haven't seen that one before. I just love Elegant Edges! Your card is so soft and sweet...love the colors and the butterfly is just perfect! Great job with the sketch, Helen! Pink and green are great combination. LOVE it...using my new favorite cart EE!!!! Also THANK YOU SOOOOOOO MUCH for featuring me on the Fantabulous Fridays on http://fantabulouscricut.blogspot.com/ I was DELIGHTED!!! I hope you are having a fabulous day!!! I simply love your card thanks for sharing! Hi Helen, I just love visiting your blog. Please stop by my blog, I have an award for you! Love the sketch Helen, and the card!